With the official start of fall only 2 days away (where did the time go?! ), we’re turning the spotlight on the mastermind behind one of our favorite fall patterns – Woodland Critters! We chatted with Maria F., Senior Graphic Designer and Illustrator at Paper Source, to learn about the process that went behind the creation of this concept. Where do you seek inspiration for many of your design ideas? I usually get inspiration at random times. It could be when I am out and about. When I am out shopping or at gift shops. I also get inspiration in the office by seeing our products and the print patterns on people’s clothes. Many of the times I will see designs I like and from there contemplate how I can execute them in Paper Source. Some ideas also tend to stem out from specific concepts or patterns the buyers are looking to have on products for a certain season. What inspired you to develop the woodland critters design? It all started with a patterned print I came across on Pinterest. From there, I incorporated cozy fall colors after we received feedback from last year’s color palette. For this year we wanted to take on a more classic feel by using neutral fall colors, with some pops of color. What made this design process fun and memorable? The critters were meant to look like an inked drawing, so I got to draw and hand ink all of the critters. Hand inking is my favorite way to illustrate designs, which made the woodland critters one of the most personal designs I have done. Why do you think this design reminds people of the fall? Woodland critters are generally a trendy fall theme, it never goes out of style. And I thought it would be fun to take a new spin to it. The yellow and orange leaf colors also provide a fall touch to the design. What’s your favorite thing about this design? My favorite thing about this design is that the critters are hand drawn and inked. 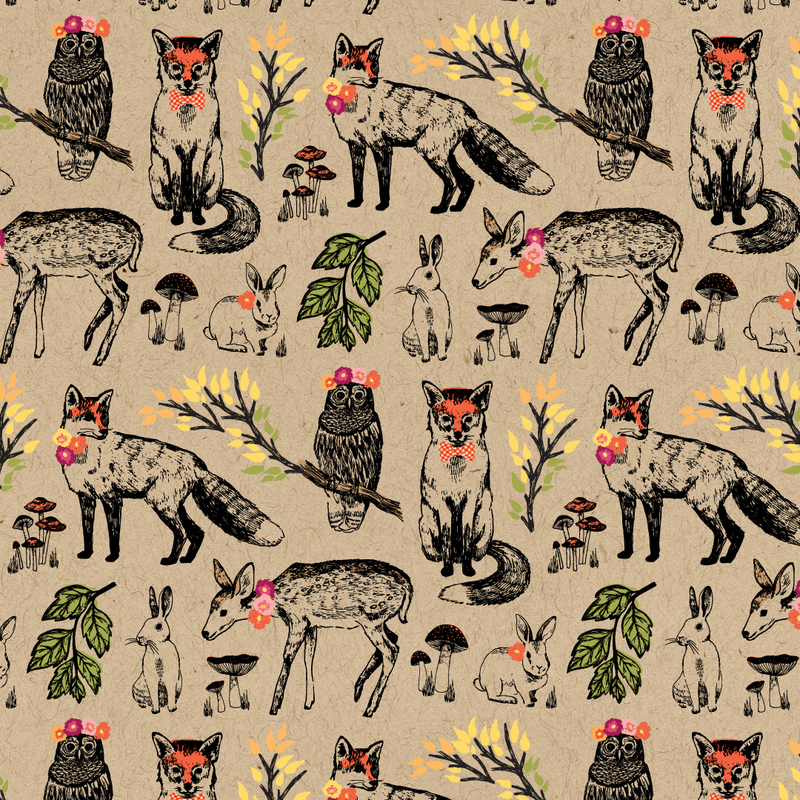 What is your favorite Paper Source product that has the woodland critters design on it? It would have to be the Hello Deer tote bag. I love stripes, so I really like how they were incorporated to the bag’s handle, making it extra cute. If you could recommend three products with the woodland critters design on it, which ones would it be? And why? The first product would have to be the Hello Deer tote bag. You can carry it everywhere, and since it’s a pretty bag you will get complimented constantly. The second product would have to be the owl mug, it is cute and unique. And you can drink pumpkin spiced lattes from it! And the third product would have to be the Woodland Creatures journals. It includes extra patterns and elements we did not use for the other products from the fall collection. And the journals will compliment your tote bag since you will be able to carry them in there. If you are feeling inspired, make sure to attend our Woodland Creatures décor workshop taking place on October 7th at your local Paper Source, check it out here. To shop the full fall collection available at Paper Source, click here. Stay tuned for more features on our favorite designs, and let our collection inspire you to Do Something Creative Every Day!